I may be in the minority here, but I just don't get that immersed in the social media scene. Hours of my time are not spent Facebook stalking or Twitter following, though I see the value of both platforms, and was one of the earliest fans of all things "Tweet". I also recognize the importance of keeping up with one's friends and family over these outlets, so I've been pleased to find a convenient and entertaining way of keeping up with the Joneses. For those with an iPad, I recommend FlipBoard. Once you've loaded Flipboard (a quick 2-3 seconds), you'll see a 3x3 grid that contains your Facebook feed, Twitter followers, specific Twitter users, people, blogs, and more. Setup is easy and you can edit the placement of your section tiles. Visually, you'll see the most recent post, photo, or story on each of the tiles, and you can flip through a second and third page of additional tiles. 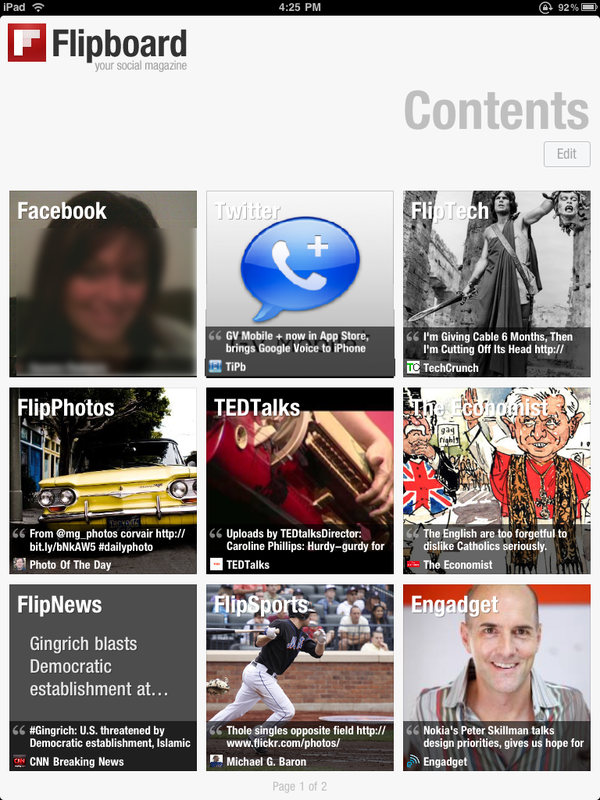 Adding new content is simple, and Flipboard offers several recommended feeds that are quite useful. It doesn't help that there's not an official Facebook app currently available on the iPad (though the #1 paid app today - Friendly -Facebook Browser - may be worth a look). I'm also a FB user who doesn't necessarily interact as much with the application, but still feel that I need to check in every now and then or fear losing touch with friends and family. 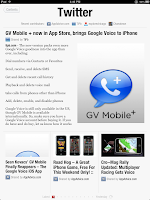 Thus, it's nice that I can quickly view status updates, and I can even add comments through FlipBoard. Though this will most likely feel very limiting to regular FB users, it is essentially all the functionality I need in my FB usage. There is no little doubt that Flipboard is onto something with its innovative design and its mission to turn social media browsing into a magazine-like experience. Investors are believers, and my enjoyable experience with the app has pushed the program into the Top 26 (aka front page iPad) status for me. More than that, I actually use the app on a regular basis, and it helps me quickly browse Facebook, Twitter, and a whole lot more in a visually stimulating and overall enjoyable experience. 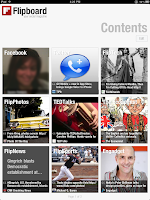 Flipboard is currently free for the iPad in the App Store.